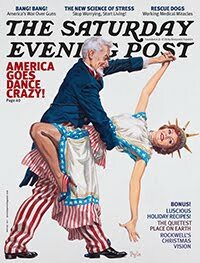 In an unusual closing of the circle, I have now done a 'Saturday Evening Post' cover. I was honored, and more than a bit cognizant of the ghosts that came on the heels of the commission. Yipes! Luckily, I had two very good models, who soldiered on through major wardrobe malfunctions (no, not THAT malfunction!) and curious onlookers wandering by the setup.